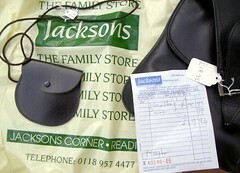 There are two customer entrances to Jacksons. One entrance goes into the main foyer and is lined by accessories. The other entrance goes directly into the Mens department. A girls entrance and a boys entrance. This weekend I went in through the girls entrance and got no further than the handbags. Wendy: Oh, yes, of course. Could you show me the black bag on the 2nd shelf down, 2nd bag in from the right, left a bit, next one along, yes, that’s the one. Wendy: its certainly very dark, I’m looking for something to carry my passport , money and camera when I go on holiday. The 3SA gets enthusiastic and starts pulling out all sorts of bags from the shelves, talking knowledgeably about her stock and even suggests that I try looking in TJMaxx! A car at the traffic lights outside loudly rev’s its engine. 3SA: All the criminals pass by here, with two police cars before the van and 2 police cars after the van, the Crown Court is just around the corner, recently one of the prisoners escaped you know. 3SA: yes, they all come past here you must check your insurance. 3SA if you are taking your camera on holiday check that your insurance covers your camera, my friend didn’t and regretted it. Make sure you check your medical insurance, my friend broke her arm on holiday and her insurance only covered her for one hundred pounds, she had to pay for a hospital stay over night and to fly home early. Wendy: I’m going to Greece, they have a National Health Service and as members of the European Community…..
3SA: Spain is in Europe and my friend still had to pay, check your medical insurance. About 20 minutes later I emerged from Jacksons. Smiling. Armed with lots of extremely useful holiday advice, and a ‘Navy Blue’ handbag that looks black to me, feeling as if 3SA is already my honourary Aunite. She is certainly more than a familiar stranger. I should pop in after the holiday to show her some pictures and confirm that I got through it without needing an insurance claim. Jacksons really is quite the friendliest of stores as long as you stay the right side of the counters and know your bag-colours. This scribble was published on Monday, June 30th, 2008. You can follow any banter on this scribble with the RSS 2.0 feed. You can share your inspired musings after typing the anti spam word near the bottom of the page. But no Pinging because its too naughty. yourself banned from Jacksons. Do be careful. TJ and TK are UK / US versions of the same store… no idea why they change the name! TKMax does do lovely handbags, have a look if you’re ever near the Broad Street Mall at the ‘other’ end of Reading!